Electronic eBook version. 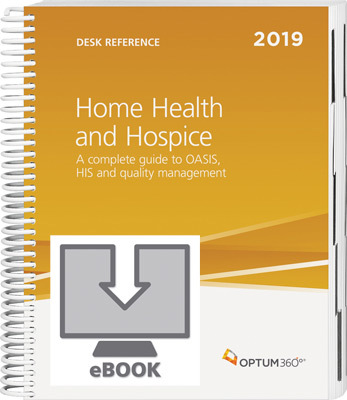 Optum 360's new coding manual for home health and hospice is a comprehensive guide to OASIS and the Hospice Information Set. Learn about these data sets with documentation and reimbursement tips, regulatory changes, and more. A complete guide to OASIS, HIS and quality management. Optum360 Edge — Documentation guidance is provided. Understand what is required and necessary for reimbursement; documentation tips are provided. Understand payment methodologies. Review payments for Home Health and Hospice. Identify role of coding in Home Health and Hospice. Helps professionals understand the role of coding ICD-10 in both disciplines. Provides clarity in quality measures. Know the IMPACT Act and outcomes for post-acute care, planning necessary for quality, and the usage of data reports. Know what information is specific to OASIS and to HIS. Resources, guidance, and tools are provided. History of OASIS and HIS Data Sets is included.